Exciting news! The new 2016 Entertainment coupon books are available, and through September 28, 2015, you can score $5 off your Entertainment book plus get FREE shipping on your order! Entertainment coupon books contain scads of coupons for businesses in your town – restaurants, oil change shops, golf courses, retail stores, service providers such as appliance repair outfits, tire and battery shops, pizza delivery, children’s bounce houses, fast food, car rentals, hotels, travel, skating, bowling, concerts, baseball games, ice cream parlors and much more. 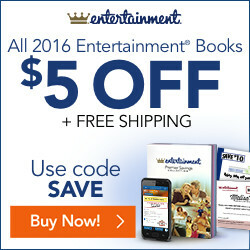 Save $5 Off your new 2016 Entertainment Book and enjoy FREE Shipping at Entertanment.com! Use Entertainment coupon code SAVE (valid until 9/28/2015). Coupons vary by city, but some of the major chains in my local Raleigh Entertainment coupon books include Jiffy Lube, Pizza Hut, Burger King, Long John Silver’s, The Little Gym, Papa John’s Pizza, Steak ‘n Shake, Sonic Drive-In, Precision Tune Auto Care, A.C. Moore crafts, Fred Astaire dance studio, Rocky Mountain Chocolate Factory, Auntie Anne’s pretzels, Cinnabon, Penn Station Subs, Quiznos, Smoothie King, Rack Room Shoes and National Tire and Battery. Save up to 50%: The Children’s Place Coupon Code Not Needed!